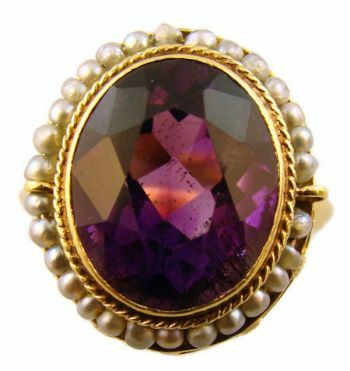 Description: An Antique 14k yellow gold ring with an oval cut amethyst framed in seed pearls. 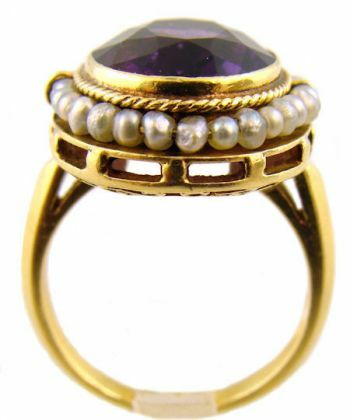 The 12x10mm 4.5 carat amethyst has a deep medium dark purple color. 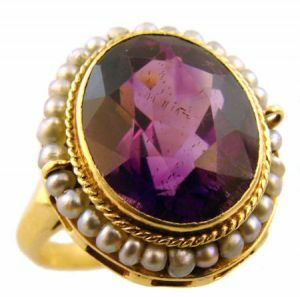 The amethyst has fine needle like inclusions that are not eye visable. Loose amethyst stones of this size & quality retail for $200 alone. The under gallery has a hand cut scrolled open work design. 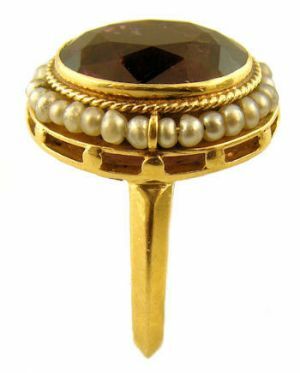 Surrounding the amethyst is a 1.5mm seed pearl strand on a wire frame. Unmarked but tested 14k. Circa. late 1800's to early 1900's. Measures: Measures 5/8" by 9/16" wide across the top by 1/4" in height. Condition: Excellent. No wear or abrasion to the top surface of the amethyst. Shipping: Ships in approx. 1 to 3 days, unless resizing is required which will add an additional week.